CSSU x Platterz Hackathon: Hungry for hacking? You are viewing: > Home > News & Events > News > CSSU x Platterz Hackathon: Hungry for hacking? From on-demand delivery services, to predictive technology, food tech is changing the way we eat. On February 16, the Computer Science Student Union (CSSU) partnered with Platterz Office Catering, co-founded by U of T computer science alumnus and former CSSU president Eran Henig, for a 24-hour hack to remix the food industry and find innovative solutions towards improving food-related tech. The winning app/tool found the cheapest grocery basket that satisfies macro-nutrient goals and helps people eat healthy and stay on budget. 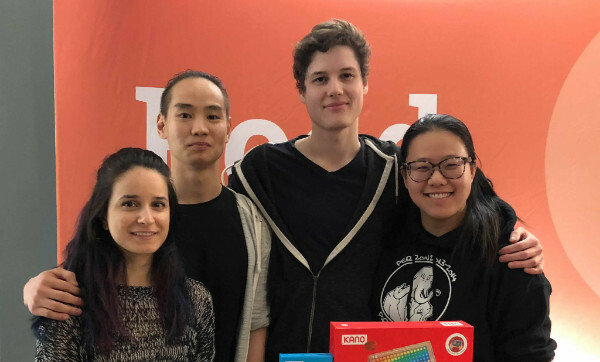 Team EatHackLove: Isabelle Nema (computer science), Timur Borkhodoev (computer science), Will Ginsberg (computer science) and Melanie Yu (Rotman commerce).